I don’t like to add posts about works in progress, as I can jump from one project to another, and thus never finish the piece in question. However that also means that if I don’t dedicate myself to getting something done this blog will sit dormant for a long time. That is just something I will need to work on as I go along. I had hoped creating this blog would help me pick up the pace on some projects, so far not the case, but maybe I will blame that on the summer. Hard to hide in the basement painting when it is nice out. We will see what the fall and winter brings. The good news is that I actually have some finished minis ready to post. 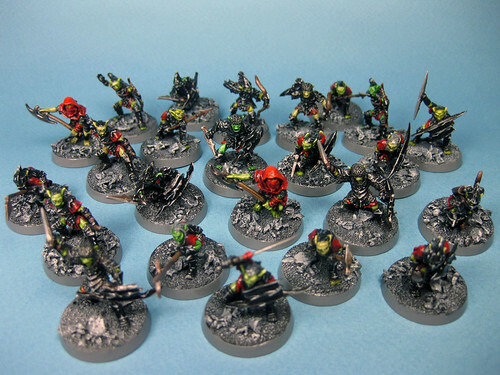 I just spent what feels like the last few months painting 24 Moria Goblins from the Lord of the Rings, sold by Games Workshop. I am glad they are done, but they are less than 1/3 or my total Moria army, and that doesn’t even include the trolls or spiders. Anyway I will add a few posts over the next few days to show them off. Here is a group shot as a teaser. This entry was posted on September 23, 2011 by triplezeropainting. It was filed under LOTR .